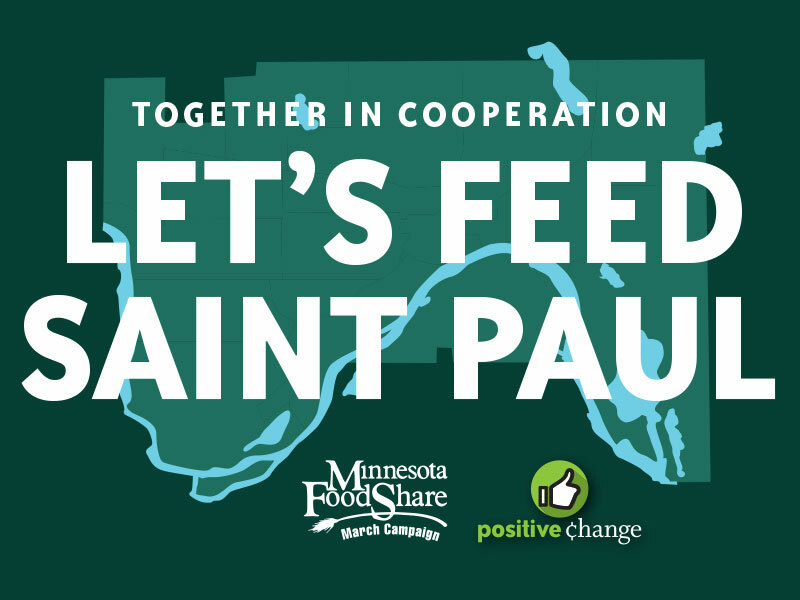 March’s Positive Change recipient is the Minnesota FoodShare March Campaign. Each year, Mississippi Market participates in the campaign, a program of the Greater Minneapolis Council of Churches that provides food, funds, and educational materials to over 300 food shelves across the state. The March Campaign is the largest food and fund drive in the state and has been operating annually since 1983. This year, we are participating in the campaign along with 12 other food co-ops from around the state. Last year, the “Cooperating MN Food Co-ops” team raised a combined total of 109,371 dollars/pounds of food and ranked 3rd in the state for corporate/business drives! Mississippi Market’s goal this year is to raise a combined 19,000 dollars/pounds ($15,000 and 4,000 pounds of food). During the month of March, you may round up your purchases or donate bag credits at the register to help support five local food shelves. March Positive Change proceeds will be donated to Hallie Q. Brown Community Center, Keystone Community Services, Department of Indian Work, Neighborhood House, and Merrick Community Services to help increase community food access in the neighborhoods we serve. A dollar doesn’t get you very far these days. However, when it comes to supporting your neighborhood food shelf, one dollar can feed a person for an entire day. Twenty dollars can feed a family of four for five days. Imagine the cumulative impact on our communities when we all give a few dollars to those with limited access to healthy foods. During the March Campaign, all funds and food donations raised will go directly to our five local partner food shelves. Join us in the fight against hunger!